Specimens collected from the Chalakkudy River for the aquarium trade. Another individual from the Chalakkudy. surendranathanii: named for Shri. P. K. Surendranathan Asari “Chief Conservator of Forests, Kerala Forest Department, who has been a constant source of encouragment to Wildife research activities in the state”. Known only from the Chalakkudy, Periyar, and Pamba river basins in the state of Kerala, southwestern India. Type locality is ‘ Orukomban, tributary to Chalakkudy River, 10°22’N, 76°41’E, Kerala, India, elevation 483 meters’. The type series was collected from a stream-like tributary of the Chalakkudy River at an altitude of 483 m AMSL. In March 1996 the habitat measured around 15 m across and comprised shallow (~ 20 cm deep) water flowing slowly through moist deciduous forest over a substrate of pebbles and boulders. In the Periyar River the species has been collected from a perennial regulated stretch between two dams at approximately 720 m AMSL. The water flows slowly between large boulders and bedrock, and the area is generally highly-modified due to agriculture and other human activities. In contrast, it has also been recorded in a fast-flowing tributary of the Pamba River with a rock and sand substrate at 160 m AMSL. G. surendranathanii has appeared in the aquarium trade on a handful of occasions and has been marketed as ‘green algae-eater’. It has an elongate, shallow body shape (depth at dorsal-fin origin 12.5-16.23 % SL), and can be further diagnosed by the following combination of characters: snout with numerous, smooth tubercules, only a few with horn-like projections; no deep transverse groove at snout tip; inter-orbital region flat; two pairs of barbels; mental disc well-developed with width 6.28-7.14 % SL; anterior portion of breast scaleless; body scales with black edges; a black spot at upper extremity of opercle. 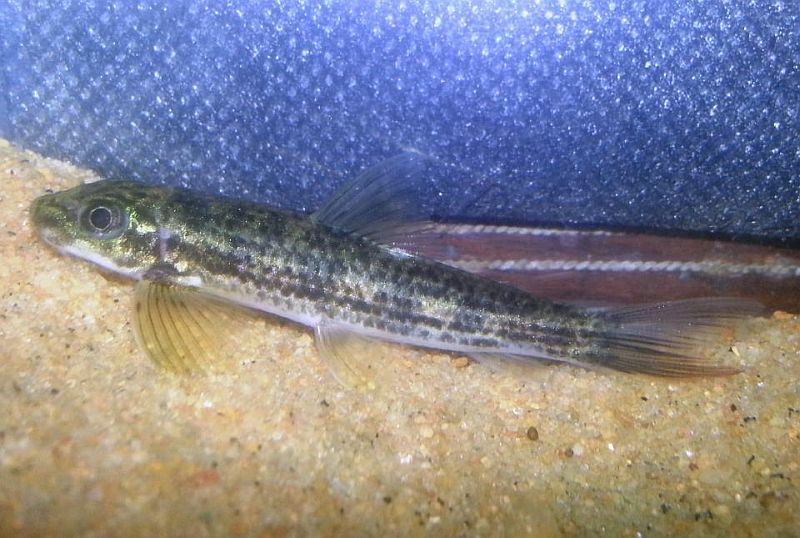 Garra surendranathanii - a new cyrpinid fish from the southern Western Ghats, India. A new species of the genus Garra Hamilton, (Cypriniformes: Cyprinidae) from Nethravathi River, Western Ghats, India. Garra palaruvica, a new cyprinid fish (Cypriniformes: Cyprinidae) from Kerala, Western Gnats, Peninsular India.